Who would have thought our little group of crafty activists would be featured on the front cover, page 3 and page 16-17 of Big Issue North?! Well definitely not us considering we are so crap at telling the media what we are doing! It just seems odd to contact the media and say “Hi, we are amazing and you should cover us in your publication”. But luckily journalist Jameela Oberman supports our work and did the leg work for us. Thanks Jameela for such an in depth and positive feature. We really hope that craftivism is seen as one of many legitimate methods of activism that can provoke thought, conversation and hopefully action but in anon-threatening way and a way where the viewer has to make up their own mind best generic online pharmacy rather than being told what to think/do. We see craftivism as a great way to engage people in politics that might not feel comfortable with other activism methods or who might not have thought about being political before but where attracted by our stitching projects. 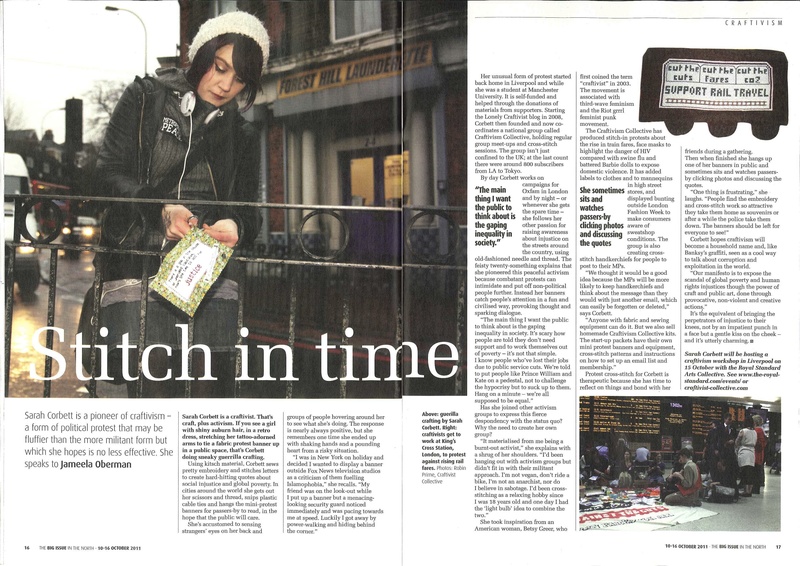 We really hope that this article shows Big Issue North readers that there are so many different ways people can pick to engage in politics, therefore there is no excuse not to join the fight for a better world!